When you vis­it the old Hostert ceme­tery, you put your feet on his­toric ground. In fact many old debris and ruins reminds us of the rich his­toric back­ground of the ceme­tery and going back to times of the Celtic coloni­sa­tion when the site was called “Ande­thanna” (Anven) or and when it had been a Gal­lo-roman fort. 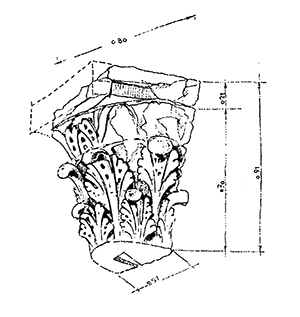 The exca­va­tion of an old Corinthi­an archit cap­i­tal, found in 1970 had been an impor­tant dis­cov­ery. The frag­ment is made out of coral lime­stone from Dif­fer­dan­ge or Audun and had prob­a­bly been an ele­ment of a mon­u­ment or even a tem­ple. 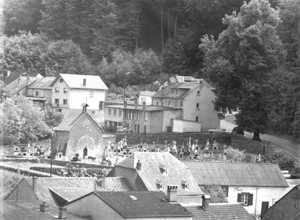 Until the year 1850, all the dead from the parish of Hostert and Nieder­an­ven and until 1890 also those from Ern­ster were buried at this old ceme­tery. In 1969 the ceme­tery was extend­ed. In the new sec­tion you can find the tombs from 1980 until 1990 and in the old part there are tombs going back up to the 19th cen­tu­ry. Anoth­er mon­u­ment was stand­ing in the entrance of the ceme­tery: the old lime tree of Jus­tice. Already dur­ing the “Ancien Régime” times, peo­ple met there, in the shad­ow of this mighty tree to dis­cuss and debate the “Jahrged­ing”. For many years lat­er the tree served as a meet­ing point for juris­tic matters.In 1974 how­ev­er this nat­ur­al mon­u­ments broke apart and had to be cut down. 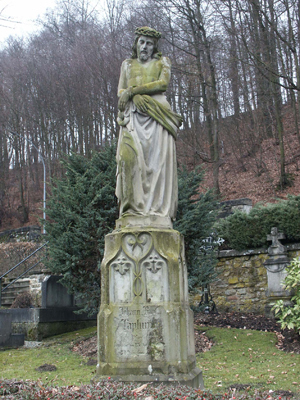 The most impor­tant mon­u­ment is that of the local priest Jean Laplume (1797 – 1869), buried in front of the ceme­tery chapel. He died of as a vic­tim of a vio­lence felony. 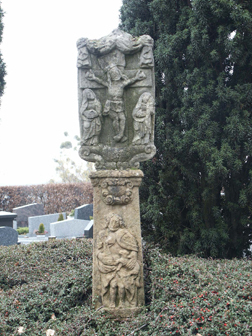 The fig­u­ra­tive tomb­stone was cre­at­ed by Jos Fis­ch­er from Greven­mach­er. It is com­posed by an “Ecce homo” stat­ue, show­ing the dates of the priest’s life and an appraisal of his mer­its. Anoth­er mon­u­ment was stand­ing in the entrance of the ceme­tery: the old lime tree of Jus­tice. Already dur­ing the “Ancien Régime” times, peo­ple met there, in the shad­ow of this mighty tree to dis­cuss and debate the “Jahrged­ing”. 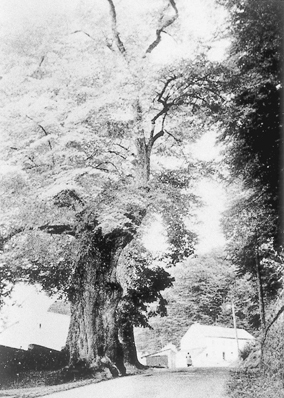 For many years lat­er the tree served as a meet­ing point for juris­tic mat­ters. In 1974 how­ev­er this nat­ur­al mon­u­ments broke apart and had to be cut down. The old road cross is dat­ed ear­ly 19th cen­tu­ry and is com­posed by two dif­fer­ent ele­ments from two oth­er road cross­es. The upper part shows a relief of a cru­ci­fix­ion scene, made out of a grey stone. It is stand­ing upon a stele formed base made of yel­low sand­stone, show­ing a St.John fig­ure. An inscrip­tion says the names of “Cater­rin Lorens, Maria Lorens” and goes back to the year 1809. The fig­ures and style themes, like cov­ings, car­touch­es and a gar­land like drap­ery are all made in a baroque style.